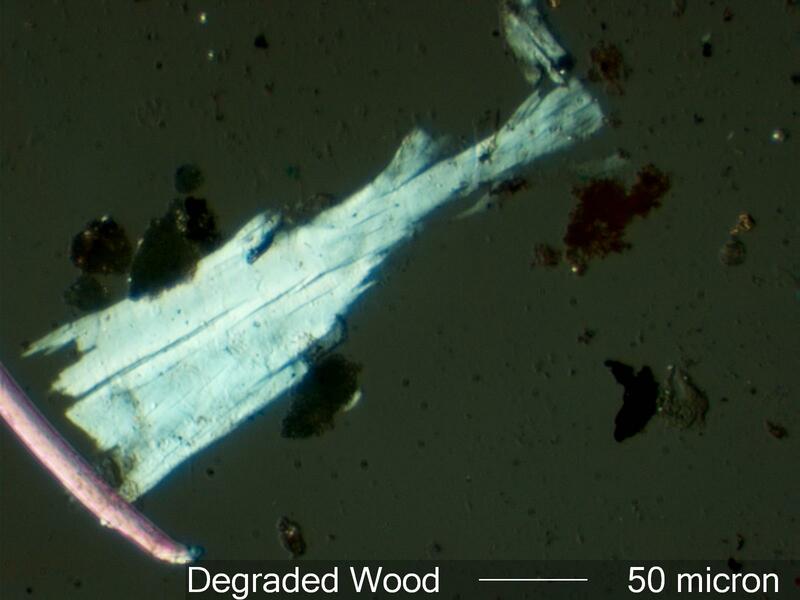 This is an example of a wood fragment that has undergone hydrothermal degradation in a transformer environment. The average polymer length, DP, is reduced with a resultant loss of birefringence and a reduction in the refractive index along the length. Wood is used as spacer material and blocking material in some transformers. This material will degrade like other cellulose materials in a transformer over time. This type of degradation indicates temperatures typically over 90 degrees Celsius and elevated moisture content. Hydrothermally degraded wood often exhibits tears normal to the long axis of the fiber. The birefringence is typically below 0.01 by the time these tears are evident. The wood fragment may be quite irregular in shape, having lost mechanical integrity in all layers of the fiber. Sawdust from construction or assembly typically settles to the bottom of the tank and becomes incrusted with iron oxides over time. Its appearance is quite different than the wood fragments generated as a result of aging in the transformer.